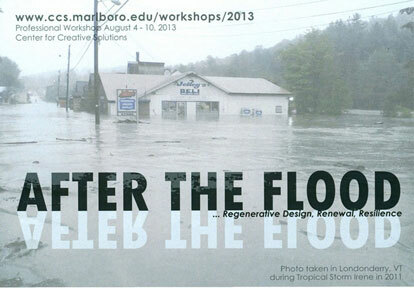 The Center for Creative Solutions is offering a unique professional development workshop entitled “After the Flood: Regenerative Design, Renewal, Resilience.” The six day workshop will run from August 4th to 10th in Jamaica, Vermont and will offer the opportunity to work collaboratively with an interdisciplinary team of exceptional practitioners, including Michael Singer and Liz Lerman, and engage in a creative process that opens up new thinking about rural communities affected by Tropical Storm Irene in 2011. The workshop will focus on the village of Jamaica, VT, which lost historic buildings and land that made up its center. The workshop will include professionals from the arts, public history, sustainable landscape design, planning, engineering and other disciplines to experience a creative process for addressing 21st century challenging issues. For more information and to register, please visit the CCS website.